Generators are the greatest invention of all when it comes to providing RV campers with luxury and convenience. Nowadays, we can still enjoy using phones, ovens, refrigerators and other household appliances even while in the middle of nowhere. When I asked RV campers about whether they are certain that their generator is the best one, most hesitated. Yes, many of us are unsure what to buy and how to choose the best portable generators for RV camping. If you have the same problem, let check these top rated portable generators for rv below. Honda is one of the pioneers of inverter technology. 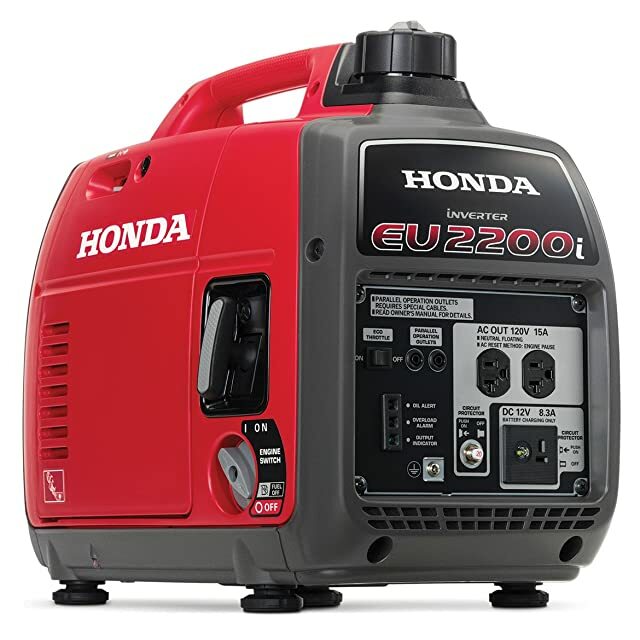 The Honda EU2200i inverter generator is the first item I would like to introduce in this list. This generator operates on the powerful 121cc Honda GXR120 engine. It consumes less fuel, and at the same time, add up 10% more runtime than other models. This exclusive engine is known as a quiet commercial motor. Depending on the distance, it generates a low noise level of between 48 to 57 dBA. This is ideal for camping since you won’t disturb others in the camping site with the noise. I personally never received any complaints from my camping buddies about the noise. The GXR120 was initially made for heavy-duty tools and equipment. Some people may think the 121cc engine is way too small, but I can guarantee its power and reliability. The fuel tank of 0.95 gallons allows this machine to run from 4 up to 9 hours depending on the load capacity. For example, if you only want 25% of full load, the EU2200i will be able to work for 8.1 hours continuously. Plus, this inverter generator is compatible with different appliances. It starts off with 2200W and maintains the performance at 1800W. You can run things like refrigerators, ovens, hair dryers, lights and many more. I have to admit that it is truly a product of applicability, especially for those who want to access to electricity while on their RV camping trip. With a small tank size, the Honda EU2200i offers utmost transportability. The product weighs only 46.5 lbs. You can easily carry it around. It also features a firm handle, making the transport as easy as ever. I particularly like the compact design. It doesn’t take up too much space; therefore, you can put it in your car without any worries. If you need more power, the Honda EU2100i can also offer you. You can easily pair one with the same or different model from Honda to gain maximum performance. Plus, this item features shut off valve that works automatically when it notices low fuel. Next time when you are in emergency situations, the generator still can provide you with electricity. There is a small concern though. Some people claimed their generators sometimes refuse to start when they let the ethanol gas stay too long tin the tank. To get rid of this problem, make sure that you put enough fuel for one time use only. If you value versatility and functionality the Honda EU2200i super quiet inverter generator should be your top-notch choice. If you are a big fan of rustic camping, you can’t ignore this exception inverter generator from Briggs & Stratton. The model 30651 P2200 utilizes 111 cc OHV engine. This powerful motor can generate 2,200 starting watt and works perfectly at 1700W. It allows you to use different camping appliances such as smartphone, lights, crock-pot, and refrigerator without eating up too much gasoline. Furthermore, the PowerSmart technology reduces that harmonic distortion rating to 3%, making it safe to charge your smartphones or laptops with this generator. The package includes an adaptor with 2 USB ports, making it even easier for RV camping life. This model is also one of the quietest generators in the market. It only creates 59 dBA of noise level at a distance of 23 feet. It is as loud as a normal conversation or background music. Certainly, nobody will nitpick about that. When it comes to RV camping, transportability is the most important thing. As you can see, the Briggs & Stratton 30651 P2200 weighs 54.6 lbs – the heaviest model in the list. It is relatively bulky, but the model features a two-sided handle so that you can carry it with two hands. The fuel tank of this generator is about 1 gallon. For those who don’t need electricity for too long, a 1-gallon generator will provide enough power. At 25% load capacity, the generator can work up to 8 hours, making sure that you have access to electricity when needed. Regarding the design, the Briggs & Stratton 30651 P2200 is very compact. It doesn’t eat up space in your RV car. Plus, the oil fill has a built-in tray to hold oil spill while changing the oil. This is a very useful feature since you don’t waste any oil and can save the ground from being dirty. If you need more power, simply connect two similar models for more power. If you want a more powerful generator, Briggs & Stratton also offers 3000-watt 30545 P3000 models for RV camping. Unfortunately, this generator doesn’t pass the California Air Resources Board requirements; therefore, it can’t be sold in this state. 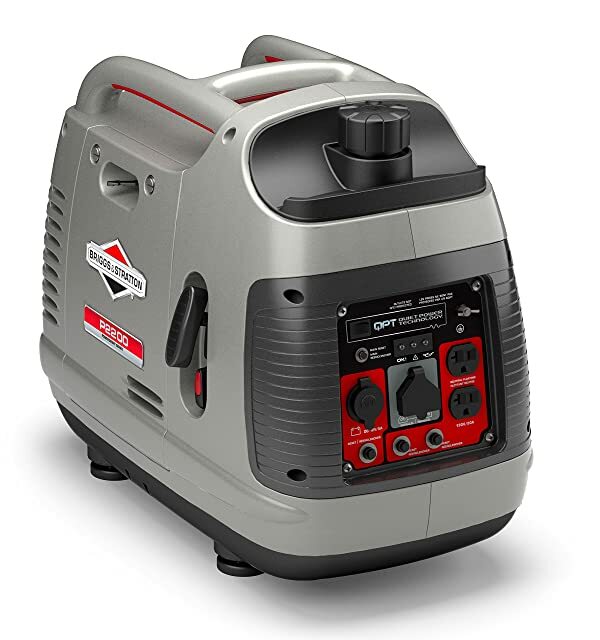 All in all, the Briggs & Stratton 30651 P2200 is a versatile and reasonably priced generator. It is an excellent companion for rustic camping trips. If you want to find an a versatile and handy RV-ready inverter generator, take a look at the Champion Power Equipment 75537i. This product adopts the 171cc 4-stroke single-cylinder engine, which is under the watch of an advanced control unit. The control unit ensures the generator’s output and harmonizes the RPM rating with the load capacity. This way, the generator runs smoothly and consumes less fuel. It generates an acceptable noise level of 58 dBA, quiet enough not to disturb your camping neighbors. The Champion Power Equipment 75537i starts off at 3100W and continues at 2800W. It can run different camping appliances such as lights, mobile phones, laptops, ovens and so on. This machine offers a high-quality current output that allows it to reduce the harmonic distortion to less than 1.3%. It guarantees nothing will happen with sensitive electronic devices such as mobile phones or laptop. What I also like about this generator is that it can operate in extreme weather, ranging from -15F to 105F, while maintaining its maximum effectiveness. When it comes to the runtime, the Champion Power Equipment guarantees that at 25% load, the generator can run up to 8 hours. Compared to other models I listed above, this is not an impressive number. What’s more, the actual runtime is not as high as 8 hours. Several users claimed that this 75537i could only run up to 6 hours depending on different load capacity. The Champion Power Equipment 75537i is an ideal partner for RV camping thanks to its portability. The model weighs only 48.5 lbs. Plus, it even features a set of wheels and a short handle on the top. There is also a U-shaped collapsible handle that allows you to maneuver the machine with ease. 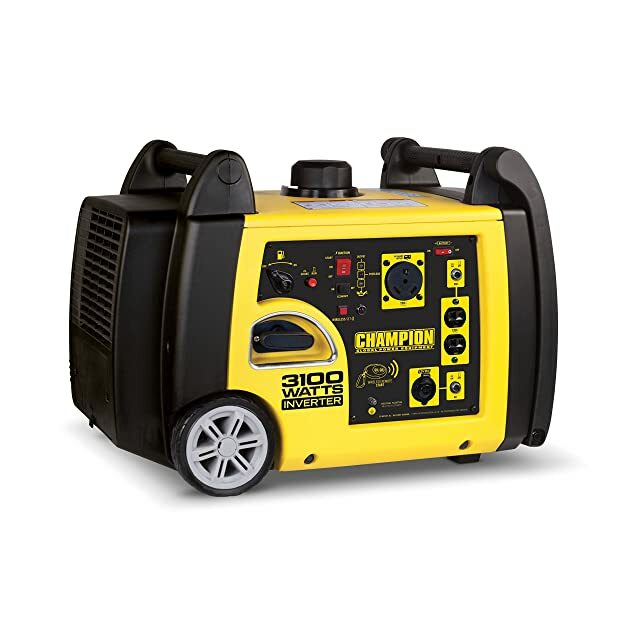 If the 3100W model isn’t enough, Champion Power Equipment also offers different versions: Champion 3100W genrators with wireless start and Champion 3400W RV ready generators. 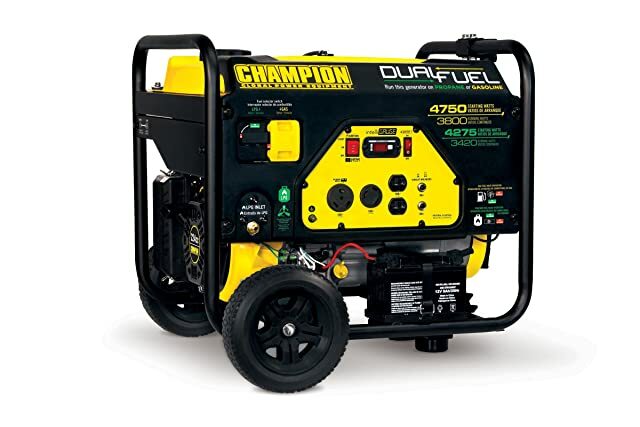 The Champion Power Equipment 75537i is a versatile generator with a lot of useful features. It is incredibly portable, which is suitable for rustic camping. WEN 56125i is a model for those who don’t have high power demand. It features a small engine of 60cc OHV. Admittedly, it is not as powerful as its counterparts above. However, when it comes to noise level, this generator is my favorite. It only makes a noise level of 51 dBA, as loud as a regular air conditioner. Noise conscious campers will love this generator for sure. Furthermore, this model features an automatic shutdown that functions perfectly. So, it’s okay to turn the machine on and forget about it. The machine will shut down itself. WEN 56125i operates on 1250 starting watts and 1000 running watts. This doesn’t allow the generator to work with energy-hungry devices such as a space heater continuously. However, you can still charge your phones, use your laptop, crock-pot, refrigerator and so on. This model from WEN weighs only 31.6 lbs. It also features a handle so that you can easily carry it around. The design is compact. It fits well in your mobile mini home. The tank size of 0.7 gallons provides enough power within 5 hours for 50% load. 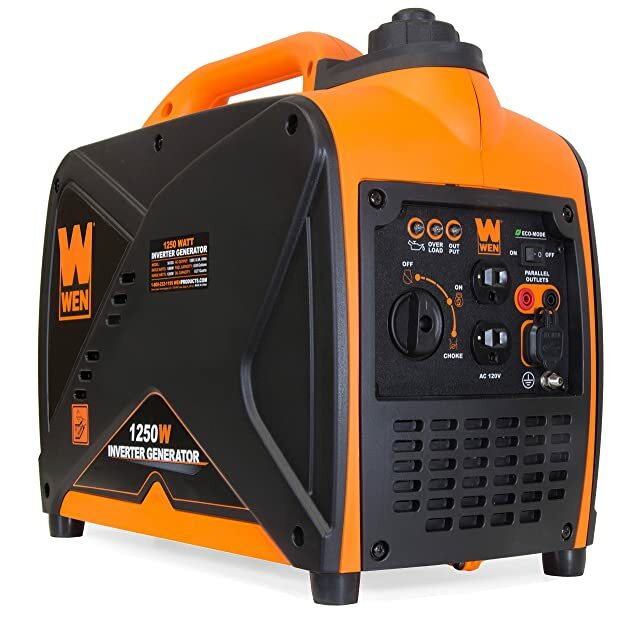 Other than the 56125i, WEN offers 56200i 2000W and 56310-RV 3100W generators. They are both suitable with RV camping. The WEN 56125i with its transportability and compact design is a product of great value, especially for those who love RV camping. The Westinghouse WGen2000 is a perfect combination between affordability and versatility. It offers many excellent features with a wallet-friendly price. This product features the 212cc Westinghouse OHV engine. This robust motor generates 68 dBA of the noise level. This is a fairly acceptable rating though I would like to have a quieter generator. The engine is also famous for its low oil consumption. That means you get longer runtime with one gas tank. To me, the Westinghouse WGen2000 is the best conventional generator for RV camping. It operates at the starting wattage of 2500W and maintains the running wattage of 2000W. This generator supplies enough power to almost all necessary appliances for camping. I want to remind you that this model doesn’t include an inverter, so it could be not good to sensitive devices such as mobile phones or laptops. But don’t worry. You can always use an Uninterruptible Power Supply (UPS) to make sure your electronic devices receive only pure wave. The Westinghouse WGen2000 features a 4-gallon gas tank. At 50% load capacity, it can run up to 20 hours. If you are looking for a machine that provides continuous electrical supply, this is it. This model from Westinghouse is designed to last. One thing that I particularly like a lot is the durable steel frame. While traditional generators would go for tubing frames, Westinghouse decided for something last longer. The drawback of this product is its lack of portability. It weighs around 90 lbs, fairly heavy to carry around. The manufacturer has forgotten to include a set of wheels at least to make the transporting process less daunting. The good news is that the Westinghouse WGen2000 is CARB, EPA, and CSA certified. You can buy and use it anywhere in the United States and Canada. 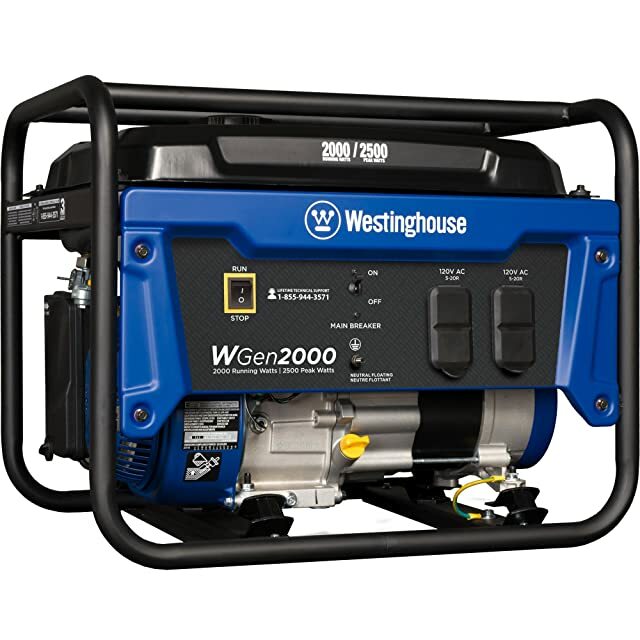 Westinghouse provides users with Wgen3600 3600W generators for RV camping as well. The Westinghouse WGen2000 has everything an RV camper needs: affordability and versatility. This is undoubtedly the best conventional generator in the list. The oil and gasoline mixing ratio should be taken into consideration. Are you looking for an environmental-friendly, inexpensive generator for your caravanning? If you want to keep the use of electricity to a minimum level, chances are you will find the PowerPro 56101 useful. This model has the peak wattage of 1000 and the running wattage of 900. It is more compatible with low-running-watts appliances such as portable fan, lights, laptops and so on. The PowerPro 56101 features 2 HP 63cc 2-stroke engine that guarantees maximum power generating. The problem arises when it comes to the oil and gasoline mixing ratio. Since it is a 2-stroke engine, there is no additional part for oil to lubricate the machine. Therefore, the oil and gasoline must come together at a particular rating, typically 50:1. Some users claim that the ratio of 32:1 is better since it guarantees the lifespan of engine. The small engine is one of the noiseless models compared to other conventional counterparts. As you can see, it only generates 60dB at 22 feet. 60 dBA is as loud as a normal conversation; it will not disturb anyone. The 1-gallon fuel tank can run continuously for 5 hours at 50% load capacity. As for a small conventional generator, the runtime is acceptable. This model is also very lightweight. It is only 36 lbs. Featuring a handle, the PowerPro 56101 is easy to maneuver as well. 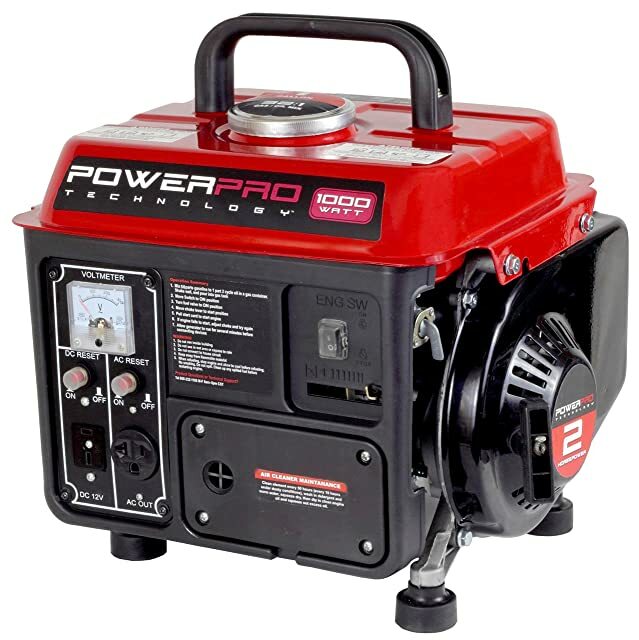 The PowerPro 56101 is a small generator, compatible with standard RV camping appliances. It is an excellent choice for infrequent use and campers on a tight budget. We all want to possess a durable and qualified generator; however, most of us hesitate when it comes to the price. The DuroStar DS4000S is a model that can balance both: cost and quality. This machine runs on a stable 7 HP air cooled OHV engine. When the generator is low in oil, the automatic shutoff kicks in and takes care of the job. The starting wattage of the DS4000S is 4000W, and the running one is 3300W. If you have a lot of appliances in your RV car, this generator can undoubtedly handle them all. With the fuel tank of 4 gallons, it can function up to 8 hours at 50% load. This probably is not the highest runtime in the list, but it is suitable for those who don’t ask for electricity in an extended period. One thing I don’t really like about this model is the noise level. It is a bit high compared to other models. You should double check with the campsite to see whether this generator is allowed or not. In return, the DS4000S is built to last. Its steel frame offers a reliable and steady structure to hold the fuel tank and protect other components. It weighs 90 lbs, as heavy as the Westinghouse WGen2000. Another plus is that this model features a set of wheels, making the transport easy as ever. You can’t buy this generator in California since it doesn’t pass the CARB-compliant standards. 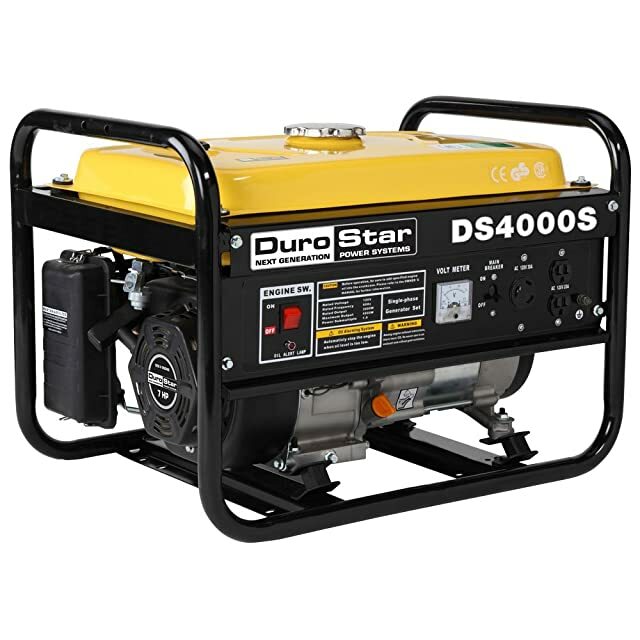 Other than the DuroStar DS4000S, DuroStar also offers 3800W generators for RV camping. Overall, I believe the DuroStar DS4000S is a wallet-friendly generator that offers a lot of useful features for RV camping. Champion Power Equipment is one of my favorite manufacturers for durable and robust generators. Their 3800W dual fuel RV Ready 76533 is the classic example. A 224cc hybrid engine powers the machine. This allows it to take in both gasoline and LPG (propane). Now, if you want an environmental-friendly generator, the 76533 model is undoubtedly the one. LGP is an alternative and clean power source. It has low emission rates and is easy to keep and bring along. If you want to transport a large amount of LPG, make sure to buy the compressed form. The robust engine generates 4750 watts of starting load and 3800 watts of running power. For propane users, the generator creates less energy: 4275W at beginning watts and 3420W at running watts. Regardless of which fuel source you use, this generator provides enough electricity for even energy-hungry appliances. It is indeed an excellent match for RV camping, especially when you bring a lot of electronic devices and plan to use them all. With a fuel tank of 3.4 gallons, the 3800W dual fuel RV Ready 76533 can work continuously from 6 to 9 hours, depending on the workload. As for propane, you need at least 20 lbs for 10-hour operation. Generators with high noise level are banned in some campsites since they are too disturbing. The good news is the 76533 model is relatively quiet. At 23 feet, it produces about 68 dBA. This indeed not the noiseless generators compared to other models above, but it is the best option for the price range. The 3800W dual fuel RV Ready 76533 is not a generator that you can hoist and maneuver around easily. At the weight of 119 lbs, it is quite bulky. However, the model does feature a set of rubber wheel and a handle, so that the transporting will be less daunting. This product is EPA and CARB certified. You can purchase it in all 50 states. You can also take a look at the Champion 3400W RV ready generator. This model is an alternative for the 3800W one. The Champion Power Equipment 76533 is undoubtedly a product of great value. Those who need a reasonably priced yet vigorous generator for frequent RV camping should go for this one. How many watts do you need to run an RV? This must be the most common asked question. Sometimes it is hard to determine how big a generator should be so it can handle all of your camping appliances. Everything comes down to the wattage. Each device has its peak and running wattage. Your task is to add up the total wattage to see how many you would need for everything to operate. The table below indicates the power requirements of some necessary RV camping appliances. For example, you need to charge your smartphone while working on your laptop. At the same time, your partner wants to cook and turn on the camp light. So in total, you need a generator with the starting and running wattage of at least 700. If you want to run the refrigerator and air conditioner at the same time, this rating would be 3000 starting watts and 2000 running watts. Of course, this the requirement when you want to turn on everything. You can also get yourself a small generator with low running watts to run a few devices at the same time. How many amps do RV appliances use? The amp rating of RV appliances is sometimes confusing, especially when you are handling too many things at the same time. If you don’t want to make a tripped breaker, you need to know by heart some necessary appliances’ amp rating. These numbers seem to be small, but if you add them up, the total can easily exceed the current capacity. Therefore, it is essential to check the amp rating of your appliances. Inverter vs. Conventional Generator for Camping? While conventional generators are in the market for quite sometimes, inverter products are relatively new to users. They offer different features, and each has its drawbacks. So which type should you choose for your camping? Portability: Portability is the most critical factor when you go on a camping trip. You certainly don’t want to haul a massive generator around the camping site. Regarding the size, inverter generators are remarkably small. Their design is compact, so you can easily fit into a small space. Efficiency: Conventional generators offer bigger fuel tanks, which often result in longer runtime. Inverter types features smaller reservoirs, which directly affect the length of their performance. However, these get-to-go generators can adjust the load speed so that they can save much more fuel. Price: When it comes to price, nothing can beat conventional generators. They cost much less than their inverter counterparts. Noise: Noise level is significant too. Generally, inverter generators create less noise. Some can function at 48 to 51 dBA. The conventional products, on the other hand, are quite loud. Though most of them never exceed 71 dBA. Choosing the best portable generators for RV camping is a daunting task since you have to balance out many factors: the price, portability, and functionality. I do believe that after reading this review, you will have a better idea of how a proper generator should be and make a conscious decision based on that.